The gusher spewed oil more than 100 feet into the air until it was capped nine days later. With that dramatic fanfare, Texas' economy was wrenched from its rural, agricultural roots and flung headlong into the petroleum and industrial age. Spindletop blows in. File photo. In the last two decades of the 19th century, railroads had made sweeping changes in the lives of many of Texas' mostly rural, mostly agrarian citizens and forever altered the face of the state. Settlements formed around temporary railroad-workers' camps. Speculators created brand-new towns out of virgin prairie beside the gleaming rails. And existing communities that were bypassed by the tracks often curled up their municipal toes and died unless they were willing to pick up businesses, homes and churches and move to the rails. The arrival of railroad transportation expanded Texas farmers' and ranchers' markets by providing faster and cheaper shipping of products. Cattle raisers were no longer forced to trail their herds long miles to railheads in the Midwest. In their classic Texas history text, Texas, the Lone Star State, Rupert Richardson, Ernest Wallace, and Adrian Anderson summarized it this way: " ... railroads were the key to progress and prosperity at the end of the 19th century." When oil came gushing into Texas early in the 20th century, the changes were even more profound. Petroleum began to displace agriculture as the principal engine driving the economy of the state, and Texans' lives were even more drastically affected than they had been by railroads. However, Texas oil has affected the lives of millions of Texans not directly involved in the oil business – Texans who receive neither a paycheck nor a royalty check based on petroleum. Oil has profoundly changed the culture of the state, and it continues to affect most Texans' lives in ways that may not be obvious to the casual observer. The presence of natural oil seeps in Texas had been known for hundreds of years before Europeans arrived in the area. Indians in Texas are said to have told European explorers that the substance had medicinal uses. In July 1543, the remnants of Spanish explorer Hernando de Soto's expedition, led by Luis de Moscoso Alvarado, were forced ashore along the Texas coast between Sabine Pass and High Island. Moscoso reported that the group found oil floating on the surface of the water and used it to caulk their boats. Lyne T. Barret drilled Texas' first producing oil well in 1866 at Melrose in Nacogdoches County. The following year, Amory Reily Starr and Peyton F. Edwards brought in a well at nearby Oil Springs. Other wells followed, making Nacogdoches County the site of Texas' first commercial oil field, first pipeline and first effort to refine crude. Several thousand barrels of oil were produced, but the price of oil was not high enough to justify further efforts at development. While drilling for water in 1886, Bexar County rancher George Dullnig found a small quantity of oil, but he did not attempt commercial production. City crews in Corsicana were also drilling for water in 1894, when they made the first economically significant oil discovery in Texas. That well was abandoned because the drillers needed to find water, not oil. But several producing oil wells were drilled in 1895 by Joseph S. Cullinan, who later helped found the Texas Company, which became Texaco. The first well-equipped refinery in Texas was built at this field, and despite the early efforts at Nacogdoches, it is usually called Texas' first refinery. The oil discovery that jump-started Texas' transformation into a major petroleum producer and industrial power was Spindletop. Exploration in the area of the upper Gulf Coast near Beaumont had begun in 1892. After drilling several dry holes, Louisiana mining engineer and oil prospector Capt. Anthony F. Lucas drilled the discovery well of the Spindletop field. Initially, the Lucas No. 1 produced more than an estimated 75,000 barrels of oil a day. Peak annual production was 17.5 million barrels in 1902. Spindletop, which was also the first salt-dome oil discovery, triggered a flood of speculation in the area, resulting in several other significant discoveries. The boom included an influx of hundreds of eager wildcatters – including former Governor James Stephen Hogg – lusting after a piece of the action, as well as thousands of workers looking for jobs. Right behind them came a tidal wave of related service, supply and manufacturing firms, such as refineries, pipelines and oil-field equipment manufacturers and dealers. It was California's fabled Gold Rush of 50 years earlier repeated on the Texas Gulf Coast with rotary drill bits and derricks instead of pick axes and gold pans. The boom turned into a feeding frenzy of human sharks: scores of speculators sniffing out a quick buck; scam artists peddling worthless leases; and prostitutes, gamblers and liquor dealers, all looking for a chunk of the workers' paychecks. Within three years, several additional major fields were developed within a 150-mile radius of Spindletop; Sour Lake, Batson and Humble were among them. Companies were soon established to develop the Gulf Coast oil fields. Many of them became the industry giants of today: Gulf Oil; Sun Oil Company; Magnolia Petroleum Company; the Texas Company; and Humble Oil, which later affiliated with Standard Oil of New Jersey and became Esso, then today's Exxon. Refineries, pipelines and export facilities became the nucleus of the major industrial region that began to form along the Texas coast around Port Arthur and Beaumont. The New Handbook of Texas summarizes the effect of Spindletop in this way: "The discovery of the Spindletop oil field had an almost incalculable effect on world history, as well as Texas history. Eager to find similar deposits, investors spent billions of dollars throughout the Lone Star State in search of oil and natural gas. The cheap fuel they found helped to revolutionize American transportation and industry." Texas oil production was 836,039 barrels in 1900. In 1902, Spindletop alone produced more than 17 million barrels, or 94 percent of the state's production. As a result of the glut, oil prices dropped to an all-time low of 3 cents a barrel, while water in some boom towns sold for 5 cents a cup. Between 1902 and 1910, oil fever spread through North Central Texas, with finds at Brownwood, Petrolia and Wichita Falls. Water-well drillers on the W.T. Waggoner Ranch in Wichita County in 1911 found oil instead, creating the Electra field. In 1917, W.K. Gordon, general manager of the T&P Coal Company's mines at Thurber, discovered the Ranger field nearby. Ironically, the wealth of oil at Ranger, and elsewhere in the state, encouraged railroads to switch their locomotives from coal to oil and helped kill the coal-mining town of Thurber. Oil was found west of Burkburnett in Wichita County in 1912, followed by another oil field in the town itself in 1918. The feverish activity that followed inspired the 1940 movie Boom Town, starring Clark Gable, Spencer Tracy, Claudette Colbert and Hedy Lamarr. The boom-town phenomenon became common across the state: The infrastructures of small farming communities near oil discoveries were inadequate to the demands of the population explosions. They hadn't sufficient lodging or eating establishments for the sudden influx. Newcomers were forced to live in hastily erected shacks, tents or even their cars or trucks. Since some of those drawn to oil fields by dreams of riches brought their families, schools became overcrowded. There were lines at cafes, at post-office counters, everywhere. Unexpectedly heavy traffic on the often-unpaved streets created massive clouds of dust during dry weather – dust that invaded every corner and settled on every surface. In wet weather, the streets became vehicle-swallowing mudholes. During the 1920s, there were discoveries near Mexia in Limestone County and more in Navarro County. Oil was discovered in the Panhandle starting in 1921, and major fields were developed all across the state during the next decade – East Texas, west-central Texas and additional fields in the Gulf Coast. In October 1930, the Daisy Bradford No. 3 well blew in near Turnertown and Joinerville in Rusk County, opening the East Texas field, the biggest field of all. Veteran wildcatter C.M. (Dad) Joiner drilled the well on land long rejected by major companies' geologists as not worthy of their efforts. The biggest leasing campaign in history ensued, and the activity spread to include Kilgore, Longview and many points north. Overproduction soon followed, as oil derricks sprouted thick as bamboo all over the field. With no well-spacing regulations and no limits on production, the price of oil nosedived again. On Aug. 17, 1931, Gov. Ross S. Sterling ordered the National Guard into the East Texas field, which he placed under martial law. This drastic action was taken after the Texas Railroad Commission had been enjoined from enforcing production restrictions. After more than two years of legal battles, most East Texas operators accepted proration, the system of regulation still utilized. By the time the East Texas field was developed, Texas' economy was powered not by agriculture, but by petroleum. Gradually, the oil glut began to affect ordinary Texans. Soon after Spindletop, the availability of an ocean of cheap oil encouraged its use as fuel for transportation and manufacturing. After railroads converted from coal to oil, steamships followed, led by those operating in the Gulf of Mexico and the Caribbean. As automobiles became more common, roads began to be paved across the state. Mechanization of farm work increased quickly, enabling farmers to produce more food with fewer people. Manufacturing plants developed in the formerly agricultural state, using cheap oil as fuel. Texas' population scales, heavily weighted toward the rural before Spindletop, started to balance, and by 1940, the population was almost even: 55 percent rural and 45 percent urban. World War II tipped the scales, however, when wartime jobs at manufacturing plants in the cities lured large numbers of people from farms and small towns. Most never returned. This displacement of farming families was exacerbated by the absorption of many family farms into large corporate operations. Increasing numbers of migrants from other states and foreign countries also settled principally in urban centers. By 1980, the state was four-fifths urban. As of Jan. 1, 1997, State Data Center population estimates indicate that of the state's population (19,598,471), more than one-third was concentrated in the three largest counties: Harris (3,178,995), Dallas (2,032,171) and Bexar (1,342,934). Another change brought about by the discovery of oil was the enrichment of the state treasury after the legislature authorized an oil-production tax in 1905. The first full year the tax was collected, the public coffers swelled by $101,403. By 1919, the revenue from the oil-production tax was more than $1 million; by 1929, it was almost $6 million. In 1996, the last year for which we had figures at press time, it was just short of $376 million for the fiscal year. Many thousands of students attending Texas universities have benefited from oil. The boon that they have enjoyed began with Mirabeau B. Lamar, known as the "Father of Texas Education." During his tenure as president of the Republic of Texas, he urged the Texas Congress to appropriate public domain to support education. In 1839, the Congress set aside 50 leagues (221,400 acres) of land for the endowment of a university. (Land was also set aside in a separate endowment for public elementary and secondary schools.) In 1858, the university endowment was increased to 1 million acres, with the stipulation that the endowment be good agricultural land. However, the writers of the Constitution of 1876 evidently felt there was no need to appropriate arable land for an as-yet-nonexistent university. The first million acres in the endowment were located in Schleicher, Crockett, Terrell, Pecos, Upton, Reagan and Irion counties in arid far-west Texas. When the University of Texas opened in 1883, the legislature added a second million acres in Andrews, Crane, Culberson, Dawson, Ector, El Paso, Gaines, Hudspeth, Loving, Martin, Ward and Winkler counties. The fledgling university was backed by an endowment of a vast amount of land of extremely dubious value. Around the turn of the century, the University's Bureau of Economic Geology began exploring the possibility of finding oil and gas on University Lands. In 1916, although most other geologists disagreed, the University's Dr. Johan A. Udden reported that oil could be found lying atop an underground fold of rock that was believed to run from the Marathon area through Pecos County and into Upton and Reagan counties. Though erroneous, Udden's theory led to the first major oil discovery in the West Texas Permian Basin. The Santa Rita No. 1, discovery well of the Big Lake Field, blew in on May 28, 1923, in Reagan County. It was drilled on University Lands by Frank Pickerell and Carl G. Cromwell of Texon Oil and Land Company. Within a year, there were 17 producing wells in the Big Lake Field, and the University of Texas was on its way to becoming a very wealthy school. The Santa Rita continued to produce oil until it was finally plugged in 1990. The University of Texas had built few permanent, substantial buildings before the Santa Rita began producing. Most of the campus was covered by shacks, which housed classrooms, labs, gymnasiums and other campus facilities. When the oil money started flowing, however, it triggered a building boom that produced many of the structures that are still used by the University. In 1931, the legislature split the net income of the Permanent University Fund, with two-thirds going to the University of Texas and one-third to Texas A&M University. The income was further split in 1984, when the legislature voted to include all the institutions in the University of Texas System, not just the main university at Austin, and the entire Texas A&M University System. The Permanent University Fund, which receives all revenue from oil, gas, sulfur and water royalties; increases in investments; rent payments on mineral leases; and sales of university lands, is one of the largest university endowments in the world. The mineral income on University Lands from 1923 through fiscal 1998 has been $3.146 billion. Investment return in the same period has been $8.163 billion. The net income from interest and dividends from those investments plus the revenue from grazing leases on University Lands comprise the Available University Fund. The total amount of money paid to the universities from the AUF from 1923 through fiscal 1998 was $4.792 billion. These distributions help pay for construction bonds and contribute to the education and general revenues. As of August 31, 1998, the market value of the PUF was more than $6.517 billion. Texas public schools have benefited from oil, as well. In 1839, the Congress of the Republic appropriated from the public domain three leagues of land (one league is about 4,400 acres) to each county for public schools. The following year, they increased each county's allotment by one league. Public-school land grants from this source totaled more than 4 million acres. To encourage construction of railroads, the legislature in 1854 granted lands to railroad companies; the amount of land was based on the miles of track that each company laid. The legislature also required the railroads to allot alternate sections of their land grants to the public schools. Finally, in the Constitution of 1876, the Texas legislature granted half the unappropriated public domain to the public schools, which amount included the alternate sections of the railroad grants. More than 42 million acres were earmarked for public schools by this provision. The Permanent School Fund was established under rules similar to those guiding the Permanent University Fund. While most of the money in the Permanent School Fund has come from land sales, the fund retained mineral rights on more than 7 million acres of school lands. The land-sales moneys have been augmented by mineral royalties. The investment fund at the end of fiscal year 1997 totaled just under $15.5 billion. Interest drawn from the Permanent School Fund is paid into the Available School Fund, from which it is paid to the public-school districts based on average daily attendance. The total amount paid in fiscal 1997 by the PSF to the ASF from all sources was almost $692.7 million. Of that total, a bit less than $3 million could probably be attributed to oil-related sources. Thousands of Texans have been touched by Texas' black gold through the philanthropy of people who have made fortunes from its discovery, production and processing. Institutions all over the state in many different fields – health research and hospitals, education, social services, fine arts, and engineering and technology research – have benefited from the wealth and generosity of petroleum millionaires. Ordinary Texans have reaped the rewards of such gifts through the programs of those institutions. There have been far too many petroleum philanthropists to list them all in this article. A representative few, however, will suggest the great good that has been done for the residents of Texas by people who pumped their money out from under Texas dirt. Some philanthropists have donated to eclectic arrays of programs and institutions: Algur Meadows, major stockholder and chairman of the board of General American Oil Company for many years, established the Meadows Foundation in 1948. The foundation has given generously – and continues to donate – to a wide range of programs throughout Texas, primarily in the health, education, visual arts, social services and historic-preservation areas. Meadows himself endowed a museum of Spanish art at Southern Methodist University, and he willed much of his private art collection to the Dallas Museum of Art. Hugh Roy Cullen, called "King of the Wildcatters" and who made major oil discoveries in the Houston area, gave large gifts to the University of Houston, the Texas Medical Center, and the Gonzales Warm Springs Foundation (originally a hospital specializing in the treatment of victims of pediatric polio). He also made significant contributions to Houston arts organizations, the Boy Scouts and the YMCA. He established the Cullen Foundation in 1947 to direct contributions to a variety of charities. Also founded in 1947 was the Sid W. Richardson Foundation. Richardson was an independent oil producer with headquarters in Fort Worth. His foundation's gifts have been primarily in support of health, medicine, education and the Sid Richardson Collection of Western Art, open free to the public in its own Fort Worth museum. His great-nephews, the Bass brothers of Fort Worth – Ed, Sid, Robert and Lee – and their parents Perry and Nancy Lee, carry on the family tradition. The most recent and most visible Bass contribution is the Bass Performance Hall in Fort Worth, opened in May 1998. Walter William Fondren got his start in oil in the Corsicana field before the turn of the century, later becoming one of the founders of Humble Oil. Major gifts from the Fondren Foundation have gone to health and educational facilities, including Rice University, Southern Methodist University, Southwestern University, Methodist Hospital of Houston and the Methodist Home for Orphans at Waco. Robert Everett Smith, in the oil-field supplies business as well as drilling in the East Texas field, gave to a variety of causes in the fields of health and medicine, social services, education and the arts, including the Houston Symphony, the Houston Museum of Fine Arts, the Harris County Association for the Blind, Methodist Hospital of Houston, Southern Methodist University and Southwestern University. Several oil millionaires have supported mainly the fine arts and literature: Everette Lee DeGolyer of Dallas was active in petroleum exploration and production and in technological development, largely through Amerada, Texas Instruments and Texas Eastern Transmission. He and his wife supported the Dallas Symphony Orchestra and other Dallas-area musical groups. DeGolyer was also a collector of rare books; he donated 89,000 volumes of his personal collection to university libraries. He was one of the main financial backers of Texas Country Day School in Dallas, which became St. Mark's School of Texas. In 1942, DeGolyer rescued the Saturday Review, the greatly respected national literary magazine, from a serious financial crisis. DeGolyer had become friends with Norman Cousins, who was named editor at the height of the crisis. DeGolyer became publisher and subsidized the magazine until it regained its economic feet. Dominique Schlumberger de Menil, whose father was founder of Schlumberger, the multinational oil-exploration engineering firm, and her husband John de Menil, an executive in the company, collected more than 10,000 works of art. In 1954, they formed The Menil Foundation in Houston to oversee the Menil Collection, a museum that showcases their art collection. Nina Cullinan and Sarah Campbell Blaffer, daughters of early oil entrepreneurs, have generously supported many fine-arts organizations – Cullinan primarily in the Houston area, and Blaffer across the state. Nina Cullinan's father, Joseph S. Cullinan, developed the Corsicana field and built Texas' first commercial oil refinery there, was a founder of Magnolia Petroleum and helped organize the Texas Company. Nina Cullinan was a supporter of many Houston arts entities, among them the Houston Symphony, Houston Ballet, Houston Museum of Fine Arts and other art museums, as well as health and parks organizations. Sarah Campbell Blaffer, daughter of another of the founders of the Texas Company and wife of one of the founders of Humble Oil, acquired an extensive art collection. She donated many original works to the Houston Museum of Fine Arts, and she established the Sarah Campbell Blaffer Foundation to send art exhibits on tours across the state. Some philanthropists have preferred to keep their charity mostly close to home: Popularly known as "Uncle Gash," J.G. Hardin gave to Texas educational institutions, but he also provided funds for many community needs around Wichita County, where he had made his fortune in the Burkburnett oil boom. He donated land for playgrounds and contributed to several church buildings, to retiring public-school bonds and for a new electric-power plant. Hardin provided funds to establish Hardin Junior College, the forerunner of Midwestern State University, in Wichita Falls. Other colleges that benefited from Hardin's generosity included Baylor Female College (now Mary Hardin-Baylor) in Belton, Simmons College (now Hardin-Simmons University) in Abilene, Abilene Christian College (now Abilene Christian University) and Howard Payne College (now Howard Payne University) in Brownwood. He also sent more than two dozen young people through college and threw a financial lifeline to half a dozen colleges during the Depression. Edgar Byram Davis made a fortune in the shoe business in Massachusetts, then made another in rubber plantations, all by shortly after the turn of the century. With his brother as partner, Davis found oil in the Luling field in Caldwell County in the early 1920s. He built a golf course, several athletic clubhouses and various other facilities for the citizens of Luling. He also established a demonstration farm to help improve agricultural production in the area. He gave away so much money that he was almost broke when he died. Ruth Legett Jones, an Abilene native, and her husband Percy acquired vast amounts of land in west-central Texas on which oil was discovered. The foundation she established gave funds primarily to organizations in the Abilene area, including Hardin-Simmons University, McMurry College, Abilene Christian University, West Texas Rehabilitation Center and Hendrick Medical Center. The foundation also built parks and swimming pools and helped finance college educations for many black Abilene students, as well as supporting ecological, medical and historical research. George T. Abell of Midland was a self-taught geologist who made a fortune as an independent oil producer. Through their Abell-Hanger Foundation, established in 1954, he and his wife Gladys were major supporters of Midland-area organizations concerned with higher education, youth activities, cultural programs, health services and social welfare. Albert and Mamie George established the George Foundation in 1945 to direct their contributions in similar fields in their home county of Fort Bend. Much of their fortune came from oil and gas fields that were discovered on their ranch in the 1920s and 1930s. Although Amon G. Carter of Fort Worth was primarily a newspaper publisher, the Amon G. Carter Foundation he established in 1945 was funded by the sale of oil interests. The most public of the foundation's responsibilities is the Amon Carter Museum of Western Art, which opened in 1961. Its collection was built around a nucleus of Carter's extensive holdings of art by Frederic Remington and Charles M. Russell. Also benefiting from foundation funds are other charities in Fort Worth and Tarrant County in the fields of the arts, education, health care, social and human services, and programs for youth and the elderly. Much of Jake and Nancy Hamon's generosity has gone to Dallas-area charities. Hamon got his start in the East Texas oil field. Together the Hamons were major supporters of the arts in Dallas, and Nancy Hamon has continued the tradition since her husband's death in 1985. In the last decade alone, she has made major contributions to the Dallas Zoo for a gorilla habitat, to Southern Methodist University for an arts library, to the University of Texas Southwestern Medical Center for several medical-research facilities and to the Dallas Museum of Art for a major building addition. The Dallas Theater Center and the Dallas Symphony, among others, have also received gifts. Don Harrington, an Amarillo oilman, and his wife Sybil supported many charities in the Panhandle. Through the Don and Sybil Harrington Foundation, founded in 1951, they generously gave to hospitals and health-care agencies, cultural programs, higher education, youth agencies, social services and civic affairs. Among their major beneficiaries were the Don and Sybil Harrington Cancer Center; the Panhandle-Plains Historical Museum at Canyon; a science museum in Amarillo; and the Harrington Library Consortium, a computerized network of libraries of the city of Amarillo, Amarillo College, Texas Tech Medical School, West Texas A&M University and many small Panhandle towns. Mrs. Harrington also was the largest individual donor to New York's Metropolitan Opera in the company's history. Although Governor James Hogg did not live long enough to see oil discovered on family property near West Columbia in the 1920s, his children did. His daughter Ima established the Hogg Foundation for Mental Health at The University of Texas. She also gave her Houston mansion, Bayou Bend, and its collection of early American art and antiques to the Houston Museum of Fine Arts. She presented the restored Hogg family home near West Columbia to the state of Texas; it is now the Varner-Hogg Plantation State Historical Park. She also restored the Winedale Inn, a 19th-century stagecoach stop near Round Top, and gave it to the University of Texas. It is now the focus of the Winedale Historical Center, which is used for the study of Texas history. Tom Slick Jr., whose father drilled the discovery well for a large Oklahoma oil field in 1912, carried on the family's involvement in oil exploration and production. The younger Slick had a lifelong interest in science and engineering. In 1947, he established the Southwest Research Institute in San Antonio. The SwRI does leading-edge research for corporations and the government in a wide range of areas – from materials and techniques for constructing stronger bridges to more effective methods for disposing of nuclear waste to making biocidal paints that prevent the growth of mold and mildew. Robert Hughes Welder, a cattleman and wildlife conservationist, provided in his will for the establishment of the Rob and Bessie Welder Wildlife Foundation and Refuge. Although Welder was primarily a cattleman, the foundation is supported by income from oil and gas leases. The 7,800-acre refuge, formally dedicated in 1961, is eight miles northeast of Sinton in San Patricio County. Teacher-training programs are offered at the refuge, and the foundation grants fellowships and other aids to graduate students and researchers. Today, oil is no longer the predominant force behind Texas' economic development. However, in the century since Spindletop roared to life on the Texas Gulf Coast, oil has touched the lives of many Texans, and it continues to provide benefits to residents of the Lone Star State, as well as to people throughout the country. 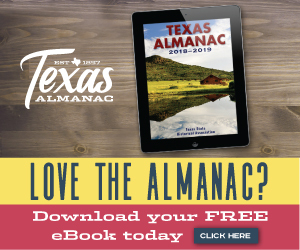 — written by Mary G. Ramos, editor emerita, for the Texas Almanac 2000–2001. The author wishes to thank historians Roger M. Olien, Ph.D., J. Conrad Dunagan Chair in Regional and Business History, University of Texas of the Permian Basin, and Diana Davids Olien, Ph.D., Senior Lecturer in History, University of Texas of the Permian Basin, for their help in presenting this material accurately. Any errors are the author's own. • Barnhill, J. Herschel, From Surplus to Substitution: Energy in Texas; American Press, Boston, 1983. • Berry, Margaret C., The University of Texas: A Pictorial Account of Its First Century; University of Texas Press, Austin and London, 1980. • Crawford, Mary G., "A History of West Texas," Texas Almanac 1990-1991; The Dallas Morning News, Dallas, 1989. • House, Boyce, Were You in Ranger? ; Tardy Publishing Company, Inc., Dallas, 1935. • Jordan, Terry G., with John L. Bean Jr. and William M. Holmes; Texas: A Geography; Westview Press, Boulder and London, 1984. • McComb, David G., Houston: A History; University of Texas Press, Austin, 1981. • Presley, James, Saga of Wealth; The Rise of the Texas Oilmen; Texas Monthly Press, Austin, 1983 (orig. pub. by Putnam, New York, c. 1978). • Texas State Historical Association, The New Handbook of Texas; TSHA, Austin, 1996. • Weaver, Bobby D., "Black Gold: Oil Development in Texas," Texas: A Sesquicentennial Celebration, Donald W. Whisenhunt, ed. ; Eakin Press, Austin, 1984.